Datta Naik, a local resident of Goa, started his film career as a music assistant of the great composer S D Burman. Datta assisted Dada Burman in a number of films. Datta was very impressed with the revolutionary songs of lyricist Sahir Ludhiyanvi. When Datta got his first chance to compose independently for Raj Khosla's Milaap (1955), he insisted for Sahir as the lyricist. The result was some very beautifully songs like 'Ye Baharon Ka Sama..' (Hemant,Lata), 'Jaate Ho To Jaao Par Jaoge Kahan..' (Geeta), etc. The music of Milaap became so popular that Datta came into the category of film industry's most eminent musicians. Some unforgettable and mersmerising compositions which give the evidence of Datta's musical dexterity are: 'Sitare Raah Takte Hai..' (Lata), 'Main Tumhi Se Poochhti Hoon..' (Lata) from the film Black Cat. 'Aurat Ne Janm Diya Mardon Ko..' (Lata), 'Sambhal-e-Dil..' (Asha-Rafi) from the film Sadhna' 'Maine Chaand Aur Sitaron Ki Tamnna Ki Thi..' (Rafi) from the film Chandrakanta, 'Ashkon Me Jo Paya Hai..' (Talat) from the film Chandi Ki Deewar, 'Kis Jagah Jaayen..' (Asha) from Light House, 'Ab Wo Karam Karen..' (Rafi) from the film Marine Drive, 'Daaman Me Aag Laga Baithe..' (Rafi), 'Tere Pyar Ka Aasra Chahta Hoon..' (Mahendra) from the film Dhool Ka Phool, 'Aaj Ki Raat Nahi Shikwon..' (Mahendra) from Dharamputra and 'Laal Laal Gaal..' from the film Mr. X.
N Datta also gave music in the film named 'Datta Naik'. He had a very strong and long association with Sahir Ludhiyanvi as his lyiricist in most of his films, till Chehre Pe Chehra (1980). 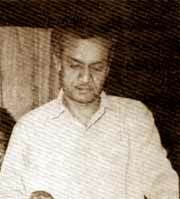 Datta Naik was a senible music director who use minimum orchestra to develop the required atmosphere as expressed in the song. He passed away on December 30, 1987. N. Dutta's class is justified by the fact that filmmaker BR Chopra had taken him as the music director for the early BR productions. The songs composed by Dutta for some of the BR films like Dhool Ka Phool, Dharamputra and Sadhana are masterpieces. The songs from Dhool Ka Phool penned by the great Sahir Ludhianvi still echo in our ears. Sample this: 'Tere pyar ka aasra chahta hoon...' sung by Mahendra Kapoor and Lata Mangeshkar, 'Dhadakne lagi dil ki taaron ki duniya...' and 'Jhukti ghata gaati hawa sapne jagaye...' both sung by Mahendra Kapoor and Asha Bhosle. The other Dhool Ka Phool song, 'Tu Hindu banega na Musalman banega/ Insaan ki aulad hai insaan banega...' is a landmark example of a patriotic and human value song, and certainly ranks among Rafi's best songs. Not to forget Lata's sweetly rendered song 'Tu mere pyar ka phool hai...' from the same film. Other Dutta gems for BR films are: 'Bhool sakta hai bhala kaun ye pyari aankhein...' from Dharamputra sung by Mahendra Kapoor; 'Main jab bhi akeli hoti hoon tum chupke se yaad aate ho...' from the same film sung by Asha Bhosle; 'Aurat ne janam diya mardon ko...' from Sadhana, touchingly rendered by Lata Mangeshkar; 'Sambhal ae dil tadapne aur tadpaane se kya hoga...' again from Sadhana sung by Asha Bhosle and Mohd. Rafi, and the Geeta Dutt classic from the same film 'Tora manva kyun ghabraye re...'. Some more Dutta hits include 'Mujhe dekho hasrat ki tasveer hoon main...' from Baaz, and 'Ashkon ne jo paaya hai woh geeton mein diya hai...' from Chandi Ki Deewar, both sung by Talat Mehmood, 'Maine chaand aur sitaron ki tamanna ki thi...' from Chandrakanta sung by Mohd Rafi, 'Ye baharon ka sama chand taaron ka sama...' sung by Hemant Kumar from Milap, 'Main tumhi se poochti hoon mujhe tumse pyar kyun hai...' sung by Mohd. Rafi and Lata Mangeshkar from Black Cat, and 'Ponchkar ashq apni aankhon se muskurao to koi baat bane...' sung by Mohd. Rafi from Naya Rasta. Even in some unheard films, Dutta's compositions are catchy, like 'Aaj ye aanchal muh kyun chupaye...' sung by Mukesh for Holiday In Bombay, 'Dhoonde nazar nazar mera chaand hai kidhar...' sung by Mahendra Kapoor and Asha Bhosle for Dilli Ka Dada, 'Pyar ka jahan ho chhotasa makaan ho...' sung by Kishore Kumar and Asha Bhonsle for Jaalsaaz, a qawwali, 'Meri tasveer lekar kya karoge...' sung by Mohd. Rafi and Asha Bhosle for Kaala Samunder. That Asha Bhosle's voice sounded very different under Dutta is evident from some lively songs like 'Kitna haseen hai jahan jaadu bhara hai sama...' from Mr. X, 'Ye hawa ye fiza ye sama...' and the Rafi-duet 'Aana hai to chale aao suhani shaam hai...', both from the film Taxi Stand and the catchy 'Jaan gayi main to jaan gayi, koi banaye bahane...' from Naya Raasta.